Children of the future will most definitely need a lesson on what a video store used to be, perhaps in How People Used To Do Stuff Before The Internet 101, especially now that Dish Network has announced it’s killing off its remaining Blockbuster stores and shuttering the DVD by mail service. 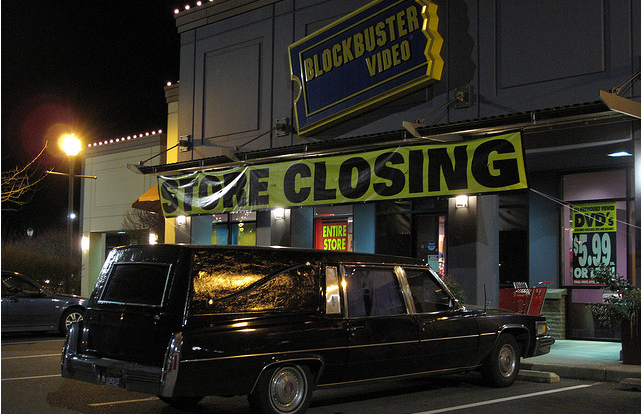 The final nail will be hammered into Blockbuster’s coffin by early January 2014, Dish announced in a press release, when the company will shut down the remaining 300 U.S. retail stores and stop mailing out movies. DVD service will be through in mid-December, so existing customers will be able to get their moves until then. Dish will hold on to Blockbuster’s video library and offer the home service to Dish customers as well as on Blockbuster On Demand. It’s not like this is a surprise — Blockbuster has been busy selling itself off in the U.S. for a year and a half and is exiting operations in the United Kingdom and Scandinavia as well. We knew last January that Dish would be shutting down a bunch of Blockbuster stores, which provided little hope for the few that remained. Expected or not, we can’t let the end of an era pass without offering at least a small salute to the store that brought movie magic into millions of homes. Without you, Blockbuster, I would never have known how exciting babysitting could be from Adventures in Babysitting, or watch Drop Dead Fred so many times I couldn’t sleep for fear of an imaginary Fred popping out from under my bed. Happy trails to you. *Thanks for the tip, Howard!